According to The Pulse Of Radio, Jimmy Page will be the commencement speaker on May 10 at Boston’s Berklee College of Music. The Associated Press reported that Page will address graduating seniors art the Agganis Arena, with the college also presenting honorary doctorates to Motown songwriter Valerie Simpson — best known for her string of classics written with her late husband Nick Ashford, including "Let's Go Get Stoned", "Ain't No Mountain High Enough", "You're All I Need To Get By", "Ain't Nothing Like The Real Thing", "Reach Out And Touch (Somebody's Hand)" and "Solid (As A Rock)". Page, who's now 70, has been playing guitar since he was 12. The Pulse Of Radio asked him what originally attracted him to the instrument. "It was just that whole thing of the transmission of ideas through the tactile quality of playing an instrument, y'know, your steel, strings and wood, translating through the electric pickup through the amp, and that's really what it is for me," he said. "It's that, some magical quality, really. Some sort of alchemy, if you like." Coming on June 3 will be deluxe editions of LED ZEPPELIN's first three albums: "Led Zeppelin", "Led Zeppelin II" and "Led Zeppelin III". 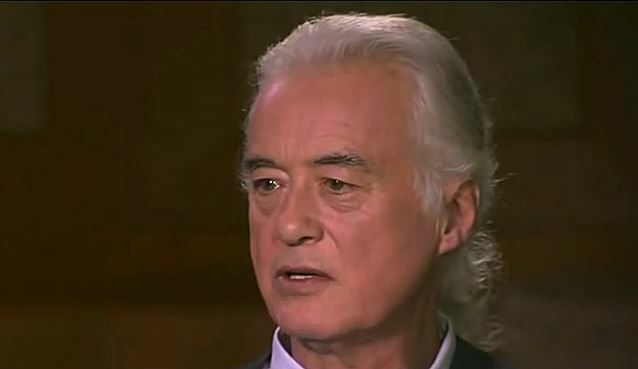 The launch of the reissue program, which is being led by Jimmy Page, includes the band opening "its vaults to share dozens of unheard studio and live recordings, with each album featuring a second disc of companion audio comprised entirely of unreleased music related to that album." The albums are being issued in six different versions — the Super Deluxe Box; Deluxe Edition; Deluxe Edition Vinyl; Single CD; Original Album Vinyl; and Digital Download.